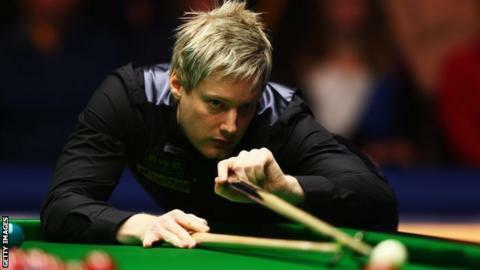 Defending champion Neil Robertson survived a four-hour battle to beat China's Yu Delu 5-4 and reach the quarter-finals of the China Open. The Australian, 32, who has been fighting a virus, let a 3-1 lead slip but rallied from 4-3 down to win in the decider with a break of 60. The world number one now faces Graeme Dott, 36, who saw off Luca Brecel 5-2. World number two Mark Selby beat 51-year-old Jimmy White 5-1, while China's Ding Junhui defeated John Higgins 5-2. Ding, who will become the first player since Stephen Hendry 1990-91 to win five ranking events in one season if he triumphs on Sunday, rounded off his victory with a break of 124. He will play Mark King, a 5-3 winner over Jamie O'Neill, in the last eight and Selby faces Mike Dunn, who defeated Craig Steadman 5-3. Ali Carter beat Peter Ebdon 5-3 and meets Ricky Walden, a 5-3 winner over Shaun Murphy. Robertson is chasing his third ranking title of the year, but looked in trouble when Yu, who knocked Ronnie O'Sullivan out of last week's Players Championship, won three frames in a row. A break of 91 brought Robertson level at 4-4, however, and he then came from 32-4 down to scrape home in the ninth frame.